Nureva has launched the WM307i model, the latest addition to its Span visual collaboration product line, featuring a full-HD 1080p solid-state, interactive projector. Combined with a user-supplied PC, the WM307i creates a 7-foot (2.13m) wide interactive digital wall. For groups that need more visual space, up to four systems can be seamlessly linked to create an ultra-wide workspace (28 feet or 8.53m). The WM307i complements the existing line of Span systems, which includes the 10-foot 2-inch (3.10m) wide WM210i and the 6-foot 2-inch (1.88 m) wide MC306i mobile system. Like these systems, the WM307i is purpose-built for Span software, which supports design thinking, agile workflow visualization, corporate training and other activities by groups that need to be immersed in visual information. 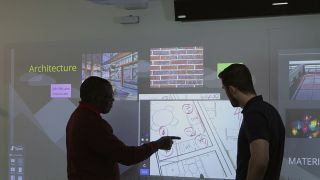 In addition, the company has launched a new quick-share feature for Span software, allowing participants to quickly add digital sticky notes and images to a canvas without the need for a Span software subscription. When a canvas owner turns on quick-share mode, the software generates an access code that can be shared with a group. After entering this code into a web page, participants can contribute notes and images to the canvas using their phones, tablets, or laptops. The quick-share feature is suited for facilitated sessions with guests, such as client-engagement meetings in professional services firms, or corporate training sessions. It also makes ad hoc collaboration sessions more efficient by quickly gathering input from the group as part of a design-thinking or innovation process.